The Community Food Grower’s Network (CFGN), in collaboration with the Landworker’s Alliance, dropped a banner over the Treasury yesterday calling for a stop to the government’s austerity sell-off of public land. 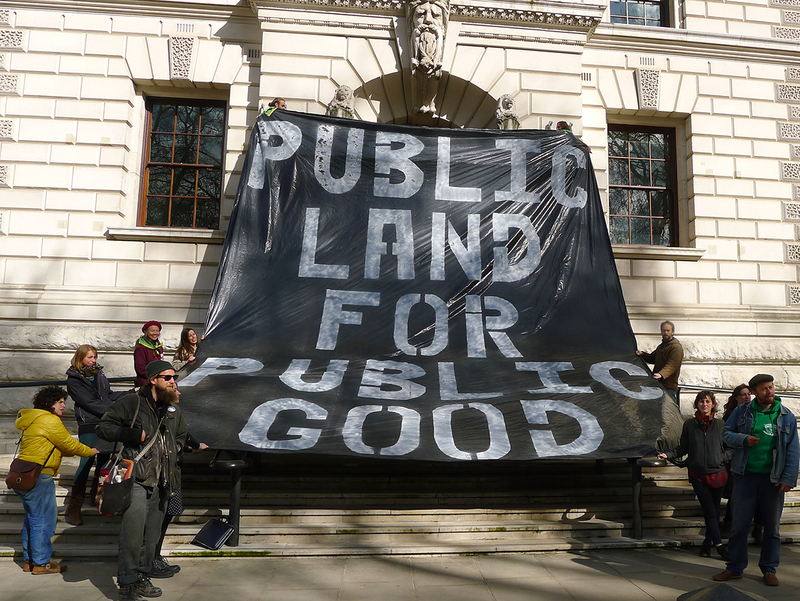 The action united urban food growers and rural farmers to respond to the increasing privatisation of land that limits long-term access to land and resources necessary to create a sustainable, fair, affordable food system. Since 2010 George Osborne has made £37bn of privatization sales under which public food and farming assets have been regarded as any other commodity to be bought and sold. Local authorities have faced increasing pressure from the Government and Treasury to raise funds through the sell-off of public assets in order to make up for cuts to central government funding for public services. Food growers from youth groups, community kitchens, and organic market gardens across London gathered at the action to mark La Via Campesina’s ‘International day of Agrarian Struggle’. Food producers in over 70 countries mobilized to highlight threats to the livelihoods of 200 million ecological and family farmers worldwide, including those engaged in urban agriculture. The action highlights CFGN’s current campaign asking London mayoral candidates to include policies that support sustainable food-growing and other community driven projects in the new London Plan. The petition asks that each local authority identify and protect land for community food production and training centres to strengthen local economies, create jobs and increase access to green spaces in the city.